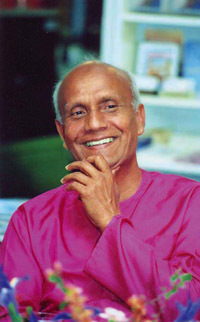 Sri Chinmoy (27 August 1931 – 11 October 2007) was a philosopher, mystic and poet who sought to demonstrate the truth of his philosophy not by argument or persuasion, but through living it every day in the 76 years he lived on earth. Sri Chinmoy believed that the key to human fulfillment lay in going beyond the self-created limitations of our mind and listening to the inner message that lies at the core of our being; therefore his entire life was a life of following that inner command. He believed that at the core of our being lay an innate desire for peace, a longing for world-unity based on the common recognition of the good qualities that lie at the heart of each and every human being; therefore the many grassroots initiatives he founded he sought to awaken that often-dormant goodness in humanity and bring it to the fore for everyone to see. He saw that everyone had their own unique talents and capabilities to contribute to a better world, so during his life he entered into every field of positive human endeavour imaginable – poetry, art, music and athletics to name but a few – and showed they were all important avenues for self-discovery and broadening the horizons of human vision. Sri Chinmoy was born in the tiny village of Shakpura, near the bustling city of Chittagong in what was then India but is now Bangladesh. He was born into an extremely spiritual and loving family, and often spoke fondly of his carefree younger days. Sadly his parents passed away within months of each other when Chinmoy was only twelve; with his brother and sisters, he travelled to the Sri Aurobindo Ashram, an spiritual community in Southern India, where he spent the next twenty years of his life. During these years he would meditate for eight hours a day, and often more, gaining significant mystic experiences which firmly established the higher and deeper realms of the soul in his life as a reality – indeed, as a deeper and more ‘real’ reality than that of the transient outer world. These inner experiences soon found a voice in outer expression – as early as the age of thirteen, he began composing songs and poetry in his native Bengali capturing the joy and newness of his rapid journey of inner discovery; many of the songs composed around this time have grown into timeless classics still sung sixty years later. The ashram was a strong advocate of integrating inner disciplines such as prayer and meditation with outer activities such as service to humanity and sports. For twenty years running, Chinmoy was the sprinting champion at the ashram and also twice held the decathlon record; he has spoken about many inner experience he had whilst doing athletics at this time, which showed him that the inner silence and outer activity can indeed go together. In 1964, the ‘inner command’ was to effect a decisive change in Sri Chinmoy’s life; in response to it, he came to the United States and settled in New York, which was to be his home for his remaining 43 years on earth. He arrived at a time of tremendous interest in Eastern philosophy shown by the youth of America, and many people came to meditate with him and listen to his soul-invoking words. In the late sixties, he embarked upon a lecture tour of all the main universities of the United States, talks which laid the groundwork of all his written philosophy. He was to follow this with tours of the Far East and Europe and talks at some of the world’s great universities there. It was in the seventies that Sri Chinmoy’s work of demonstrating that outer pursuits could go hand in hand with inner progress began to take shape. In 1973, he published a series of plays about the lives of the great teachers such as the Buddha and the Christ; the following year he began his series of mystical paintings which he entitled ‘Jharna-Kala’ (art flowing like a fountain from the inner source) and of which he was to paint over 200,000 in his lifetime. In 1974 he began playing the esraj, the haunting bowed instrument of north-east India of which he came to be known as one of the world’s greatest exponents; before the decade was out he would also take up the Indian and Western flutes and the violin. In 1976 he founded the Liberty Torch relay, a 50-state run in which the runners carried a torch evoking the ideals of “life, liberty and the pursuit of happiness” that the founding fathers of America espoused. The following year he founded the Sri Chinmoy Marathon Team, an athletics organisation dedicated to bringing out the very best in its members and those who ran in its races through the medium of athletics. Sri Chinmoy himself would run 27 marathons and ultramarathons around this time. All this while, Sri Chinmoy’s poetic output had continued on unabated whilst gradually evolving into a shorter aphorism form; in 1979, he began an epic compilation of aphorisms titled ‘Ten-Thousand Flower Flames’, a work that took him four years to complete. In each of these fields of endeavour, Sri Chinmoy’s personal motto could be expressed in one word: self-transcendence. In 1983, he embarked on an even larger collection of poetry titled ‘Twenty-Seven Thousand Aspiration-Plants. That very same year, he added the cello to the instruments in his repertoire; the following year he began playing concerts of meditative music to audiences all around the world. During his lifetime he gave over 800 of these concerts, including memorable performances in London’s Royal Albert Hall, New York’s Carnegie Hall and the Sydney Opera House. In 1987, he added a new and dynamic component to these concerts: spontaneous piano improvisations which demonstrated to the audience that inner peace also had a very powerful quality. As the years passed, he would also perform these improvisations on pipe organs in cathedrals around the world and also on various synthesisers. Throughout his life, Sri Chinmoy’s view that “The answer to the problems of this world is for every one of us to go beyond our present capacities and become better citizens of the world.” always found new and imaginative channels and outputs for expression. He travelled to many countries and met with leaders in the political, religious, cultural and sporting spheres, offering his inspiration and support to them in their own travails to make the world a better place. In 1987, he founded the World Harmony Run, a global relay event which travelled the world inspiring its citizens to play their part in a shared vision of harmony and oneness with the motto “Harmony begins with me”. In 1991, he began the first of his almost 16 million drawings – a series which used birds as a metaphor for the boundless freedom of the human soul. In 1997 the Sri Chinmoy Marathon Team began the 3100 Mile Race, the longest certified foot race in the world, under his guidance; the race is still running to this day. In 1998, he began Seventy-Seven Thousand Service Trees, his largest poetry collection yet – at the time of his passing, 47,000 of these poems had been published. A central plank of Sri Chinmoy’s philosophy was that all human beings are different expressions of the same ultimate reality, and that the inner search which all the religions of the world embody is a search which ultimately leads to the same Goal for all religions. “There is no fundamental difference between one religion and another because each religion embodies the ultimate Truth”, he observed. His work to promote harmony between faiths was recognised in his being asked to perform the opening meditation for the Parliament of World Religions in 1997 and again in 2004, and in his receiving the UNESCO Nehru Medal and the Mahatma Gandhi Award.